Need advice about a specific Lexus IS problem? Chart based on 96 repairs. See TSBs and recalls for the 2006 Lexus IS. Chart based on 74 repair trips. The repair cost chart excludes repairs made under warranty, do-it-yourself repairs, and repair trips that include maintenance. See repairs for all Lexus IS model years. US $150 Car was hard to start. Replaced battery. 35000 mi Plugged A/C drain. US $1000 Engine has developed an oil consumption problem...Known issue with IS 250, currently not admitted for IS 350's...Started using oil at 85,000 miles (1 qt per 2500 miles)...Now up to 1 qt per 1000 miles (mileage 125,000). 115000 mi Replace fuel pipes on TSB due to possible stress at bends. US $100 Brake fluid contaminate. Replaced fluid. US $570 Transmission pan gasket brittle and slow leak found. Replaced gasket. US $250 Replaced driver side lower control arm. US $400 Replaced differential with used differential. US $131 TPSM replacment. All four wheels. US $1200 Car has excessive rattles from dashboard and door. 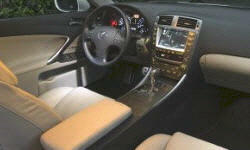 US $1200 Door rattles and dashboard rattles. Dashboard rattles still not fixed. Door rattles a little better. US $250 Continuing rattles in door and dash. 10000 mi Minor dash rattle on drivers side. 15000 mi Outside rearview mirror no longer adjusts with controls. 21000 mi Navigation system losing position. Dash rattle. 22000 mi HID headlight replaced. 25000 mi Defective cam gears causing engine grinding at cold startup. Repaired under TSB. 27000 mi Drivers mirror not remembering position. 35000 mi Dash rattles Rear brake boot replaced. 36000 mi Passenger side HID headlamp. 24180 mi Lighting of the tip of the tach needle was flickering, Xenon headlight didn't always switch on, new Xenon bulb for the headlight. All warranty repairs. Squeaking and rattling door panels (all), dash, b-pillars, driver's seat. All taken care of by the dealer under warranty. New instrument cluster installed. New indicator panel (speedo, tach etc.) due to flickering lighting of the tach needle. New HID headlight. Removed dash/door panel/seat squeaks and rattles. All under warranty. 26000 mi Front driver seat squeaks, seat rails were found to be defective. 117000 mi The lighting for the speedometer went out; Lexus said the entire instrument cluster would have to be replaced in order to fix this. US $30 Spare tire compartment lid handle broke. 66000 mi The issue was an occasional rough idle when at a stop and in gear. The resolution by the dealer that was covered under the manufacturer warranty was engine top cleaner and replacement of a gasket. US $261 dealer determined that water pump was leaking Engine idling rough at stop intermittently. Carbon build up on valve - cylinder #4 misfire.removed and disassembled motor, clean valves, ck springs, replace pistons,rings,gaskets and reassemble. Lexus repaired at no charge. Remove AC drain grommet to prevent possible water intrusion. Lexus repaired at no charge - there were no issues this is a known problem with this model and this was a preventive measure. US $580 Vehicle started running rough. VSC light on dashboard came on. Dealer replaced the meter sub-assy, intake air flow, part # 22204-31020. US $187 Exhaust system had a hole in it. US $500 Two O2 sensors failed and needed replacement. Exhaust was leaking. US $500 Failed alternator replaced. US $235 Tire pressure sensor failed and activated permanent system check warning - needed new sensor. C $100 Engine cowling broken during windshield replacement. Part replaced. C $300 Battery needed replacing after 4 years due to decreased capacity test. US $90 Caliper was frozen on driver's side front wheel. Cleaned it out and it resolved the issue. US $175 Water pump bearing gave out, causing coolant to leak out and car begin to overheat. Replaced Waterpump, and Drive belt. US $30 Leak from the low pressure line near the 90 degree bend close to the O2 sensor. A/C Line was rubbing against the O2 sensor's attachment nut on the exhaust manifold. Repair: Recharged the system with a Leak test/selant/refrigerant. Spotted the leak and it self sealed. US $1 Driver side rear wheel bearing making noise. Replaced wheel bearing hub. passenger side making noise now. Both Catalytic converters need replacing. US $60 Tachometer and speedometer needles no longer illuminated. Removed instrument panel, removed needles, re-soldered new LEDs into needles, re-assembled everything. LEDs $5, find-point soldering iron $45, several hours of my time. Squeak from what sounded like driver sun-visor area when car goes over bumps. Removed headliner three times at attempts to resolve issue. Finally discovered squeak was from dash behind instrument panel. Removed instrument panel, found squeaking mounting arm, sprayed lube, no more squeak. Loud "bonk" sound from roof center when car enter or exiting driveways. Multiple unsuccessful attempts at resolving the sound, finally found cause as aged body foam between roof cross-member and roof sheet metal, the body foam sticking to then breaking away from the roof sheet metal when car body flexes. Culprit roof cross-member located adjacent to rear edge of moon roof opening. Used hack saw blade to grind away aged body foam, sprayed lube, no more "bonk." Squeak from roof rear when going over bumps. Removed headliner multiple times at attempts to resolve issue. Finally discovered squeak coming from upper rear windshield frame, confirmed by reading similar complaints in forums. Sprayed lube, problems solved. OEM subwoofer makes "tack" sound when playing audio. Installed used OEM subwoofer from EBay, problem solved. Vanity mirror light does not come on when mirror cover is slid open, as it should turn on. Removed stitching of visor fabric on the edge facing the rear view mirror, and pulled back fabric to reveal small hole for accessing the contact points of switch. Scraped contact points, sewed fabric back using ladder stitch. Problem fixed. Interior rear view mirror glass developed a flaky look caused by reflective backing going bad. Purchased similar part from EBay, disassembled faulty mirror, swapped out mirror glass. Problem solved. 15000 mi Nav system repaired. My location cursor was off. Under warranty. 20000 mi CD player replaced. Would not read CDs. Under warranty, CD player sent to the manufacturer. CDs sent back to dealer to be picked up. 62000 mi Lowered gas mileage due to gunking up pistons during fuel injection. Oil leaked in pistons which burned more oil than expected. Known factory issue for 2006 IS models. Factory covered. 71000 mi Factory issue - gaskets at valves were leaking. Resulted in higher gas consumption and gunk build up. 29000 mi Transmission broke, replaced with new one. Rear defrost did not work, ordered new rear windshiels, returned at later date for install. Dealer stated that some how the defrost wire in windshield was broke or inoperable. 30000 mi Vehicle lurching forward when stopping or stopped. Problem with trans (again) dealer unable to duplicate. Still occurring. 32000 mi Car still lurching forward, returned with same response, unable to duplicate. I took regional rep for a ride and problem occurred with in 1/2 mile. Adjusted drive shaft Starter went out, unable to start car due to electronic ignition. €500 This was the first real problem the car suffered, other than one to replace the "marmitta catalitica", due to too frequent mileage in town. €1500 Cambiata la guarnizione della testata. Primo sintomo: non funzionava più il condizionamento, in quanto perdeva acqua. Changed head gasket. Symptom: air conditioning no longer worked, b/c losing water. See our lemon odds and nada odds page to see vehicles with no repairs or vehicles with more than three repairs. 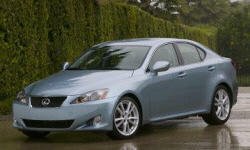 To see how frequently 2006 Lexus IS problems occur, check out our car reliability stats.